All articles mentioned in this blog post are free to access until 31 March 2019. Europe is experiencing various forms of crises in governance, policy and politics at the continental, national and local levels. Whilst many of these have been brewing for some time, the sense of political crisis is increasing with EU policies challenged by national political actors, growth of populist parties, political fragmentation, weak governments and increasing poverty and inequality in many countries across the continent. Here at Policy & Politics we have recently published several articles that can help us make sense of these crises and contribute to the policy debates to help resolve them. The politics of austerity have been central to the various crises currently facing Europe. Adam Standring explores how austerity measures were justified and implemented in Portugal. He shows that the Portuguese 2011-15 government sought to de-politicise austerity measures as externally and structurally imposed. Unpopular austerity measures were not presented as good but rather as necessary and enforced by the Troika, though the ruling party did pursue these reforms enthusiastically. Moving from the national to the local level, Pill and Guarneros-Meza explore the effect of ‘austerity urbanism’ (Peck 2012) on what they call ‘hybrid officers’. Austerity puts pressure on local governments to share risk and responsibility with third-sector organisations and community groups at the neighbourhood level. This creates hybrid officers who work for third-sector organisations with their own sets of aims that also receive public funding to deliver specific state projects. Focusing on Cardiff, the authors find significant tension in the dual role of hybrid officers whose organisations seek facilitation and cross-sectoral interdependence whilst local governments under austerity urbanism seek community self-reliance. In the context of austerity cuts to public spending, social impact bonds (SIBs) have emerged as a way of getting financial investors to enable and profit from social service delivery. Joy and Shields argue that despite claims of being evidence-based, accountable and transparent, there is little to suggest that SIBs can improve social outcomes or save the state money. The authors further critique the neoliberal character of SIBs, benefitting financial investors more than service users and entrenching inequalities. Alongside austerity cuts, the UK has suffered from stagnating wages and significant in-work poverty since 2008, despite high employment levels. Lee, Green and Sissons carry out a sectoral analysis of this pattern, which must be addressed if the UK economy is to prosper again and its workers are to experience higher living standards. They argue that efforts to increase pay must be focused on the sectors Accommodation and Food Services, Wholesale and Retail, and Admin and Support. This is both because of the number of UK workers in these industries and the poor career progression that they offer. Increasing the minimum wage, which is common in these sectors, and delivering high-quality training, to improve productivity and enable career progression, are therefore essential policies in order to address in-work poverty and produce stable economic growth. In the context of stagnating wages and growing inequalities, home-ownership has become an even more important factor for households. Ronald, Lennartz and Kadi observe how this ‘asset-based welfare’ has become more pronounced and much less inclusive since the 2008 crisis. As pensions and welfare are being cut, the prospects of becoming mortgage-free, downsizing, borrowing against equity and buying further housing to become landlords all become more important. However, unlike when homeownership was expanding, this is now intensifying family and self-reliance with the effect of growing inequalities. The intensifying crises in Europe have led to much concern about the state of democracy in different forms and on different levels. Alarcon et al. look at the effects of the 2008 crisis on participatory democracy in Spanish local authorities. They find that fewer citizens’ proposals are implemented, and those that are taken forward are the less costly options. Interestingly, it also finds that citizens adjust their demands in crisis conditions and suggest less costly proposals, but ones that are more politically challenging to current practices. One of the most significant aspects of the crisis in Europe (and beyond) is the challenge posed by populism of different kinds across the continent. Gerry Stoker explores this and asks how the governance paradigm can survive the rise of populism. He sees populists as opposing the use of markets and networks that are central to governance as a guiding principle. Stoker argues that these need to be ‘defended not as stable parts of the governing system but as constantly open to revision through sunset clauses, periodic reviews and stringent accountability’. The growing right-wing populism across the continent builds on xenophobic backlash narratives that are often ascribed by commentators to localities that are left behind in post-industrial cities. As part of the special issue on Superdiversity, Ole Jensen carried out a fascinating comparison between backlash narratives in six neighbourhoods in three European cities. Rather than the common assumption that increased immigration leads to increased racism, Jensen shows how ‘access to housing, gentrification dynamics, transportation infrastructure, and local power relations affect settlement patterns, social dynamics and backlash narratives at neighbourhood level in ways which differ not only between, but also within cities’. In a year that looks likely to be at least as turbulent as 2018, Policy & Politics will continue to explore the links between macro scale political debates and micro-scale policy analysis in relation to Europe’s various crises, to help us understand their underlying causes and societal effects. Peck, J. (2012) ‘Austerity urbanism: American cities under extreme economy‘, City, 16(6):626–655. Jensen, O. (2018) ‘Superdiversity in the post-industrial city: a comparative analysis of backlash narratives in six European neighbourhoods‘, Policy & Politics, 45(4): 643-660. Joy, M., Shields, J. 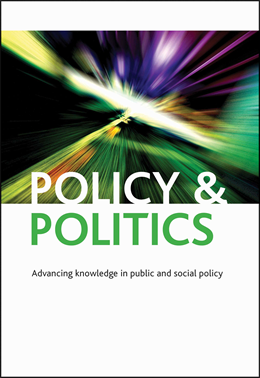 (2018) ‘Austerity in the making: reconfiguring social policy through social impact bonds‘, Policy & Politics, 46(4): 681-695. Lee, N., Green, A., Sissons, P. (2018) ‘Low-pay sectors, earnings mobility and economic policy in the UK‘, Policy & Politics, 46(3): 347-369. Ronald, R., Lennartz, C., Kadi, J. (2018) ‘What ever happened to asset-based welfare? Shifting approaches to housing wealth and welfare security‘, Policy & Politics, 45(2): 173-193. Standring, A. (2018) ‘Depoliticising austerity: narratives of the Portuguese debt crisis 2011–15‘, Policy & Politics, 46(1): 149-164. Click here to see all our virtual collections.